Peter knew the dangerous situation Jesus was in. The leaders of the church hated Jesus and were plotting to have him killed. This was no secret. It was common knowledge among his followers. Peter knew how powerful the clerics were and what it meant to defy them. He was no fool. Nor was he a coward. When the soldiers came to the garden to arrest Jesus, Peter whipped out his sword to defend his lord against a squad of armed soldiers. I think it can be said that Peter was ready to die for his lord right then and there. Its possible this outburst of Peters was connected to something Jesus had said to him just a few hours earlier. 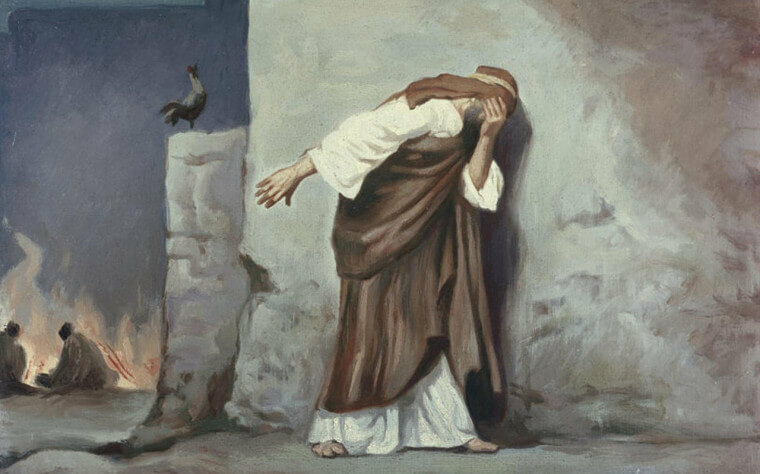 Jesus told him very calmly that that night, Peter would deny him. Not only deny him, but deny him three times. Peter had never known Jesus to be wrong, but he was determined that this prophesy would not come true. So when soldiers came for Jesus, out comes the sword. No doubt Peter remembered something Jesus had once said, “Whoever acknowledges me before men, I will also acknowledge him before my Father in heaven. But whoever disowns me before men, I will disown him before my Father in heaven.” (Mt 10:32-33). Peter was determined that this would not be his fate. But we all know the rest of the story. Not only does Peter deny knowing Jesus, he even curses and swears an oath that he has nothing to do with Jesus. Then the rooster crows. Peter looks up to see Jesus in chains looking at him and he realizes what he has done. Each day, we are presented with the opportunity to deny knowing Jesus. Many times we do deny Him. We deny Him through our thoughts and actions that we know are contrary to God’s will. We deny Him when we fail to stand up to unchristian behavior or worse, when we display our unchristian behavior to others. So we rejoice in the loving forgiveness that is our Lord’s. We pray that when Satan tempts us to go against our beliefs, to deny that we are associated with Christ, that we fight the urge, and when we fail that we pick ourselves up, set our hearts to do better. And we pray that when we our friends act in a manner unpleasing to God, that we strengthen them just as the Holy Spirit strengthens us. Atheist's to meet the Peabody ducks.